Left: Curt Hoppe, Arturo Vega, 2010. Vega helped design the Ramones logo, and later had it tattooed on his back. 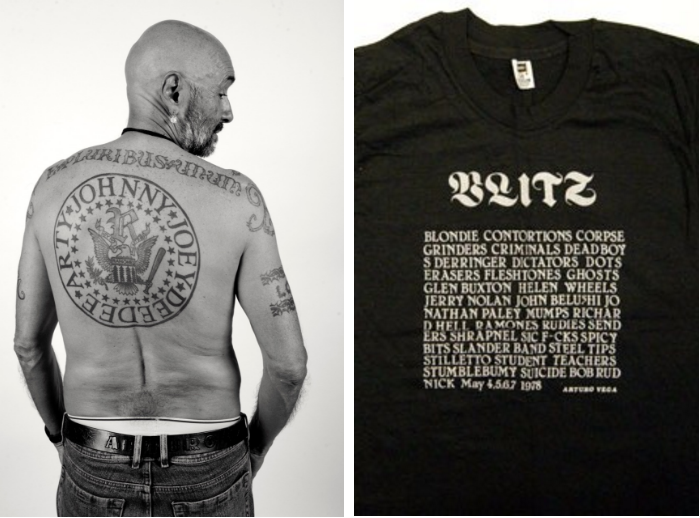 Right: Another of Vega’s t-shirt designs, for the Johnny Blitz Benefit at CBGB, 1978. This coming Sunday, June 19, two discussions at the Queens Museum will explore the relationship between the Ramones and visual art, in conjunction with the museum’s current exhibition Hey! Ho! Let’s Go! Ramones and the Birth of Punk. At 1 p.m., original contributors and editors of Punk magazine will speak on the history and influence of the fanzine that named a movement; whose hand-lettering, cartoons, and campy photonovellas (or fumetti) brought a comic-book aesthetic into rock journalism. At 3 p.m., friends and colleagues will remember late Ramones art director Arturo Vega, a pop-inflected fine artist who took charge of the band’s imagery, from their iconic logo to their imposing stage backdrops. Punk magazine t-shirt advertisement, 1976. Photographs of Deborah Harry by Chris Stein. Design and lettering by John Holmstrom. Chris Stein, co-founder of the band Blondie, will join both discussions. Stein was an original contributor to Punk, where his photographs established Blondie’s place in the magazine’s tongue-in-cheek world. A regular companion of the Ramones and Vega, Stein shared their interest in branding, and helped create the visual language of punk. Moderator Marc H. Miller, the co-curator of Hey! Ho! Let’s Go: Ramones and the Birth of Punk, is the proprietor of Gallery 98 and 98 Bowery, and was one of the curators of the 1978 exhibition Punk Art at the Washington Project for the Arts. 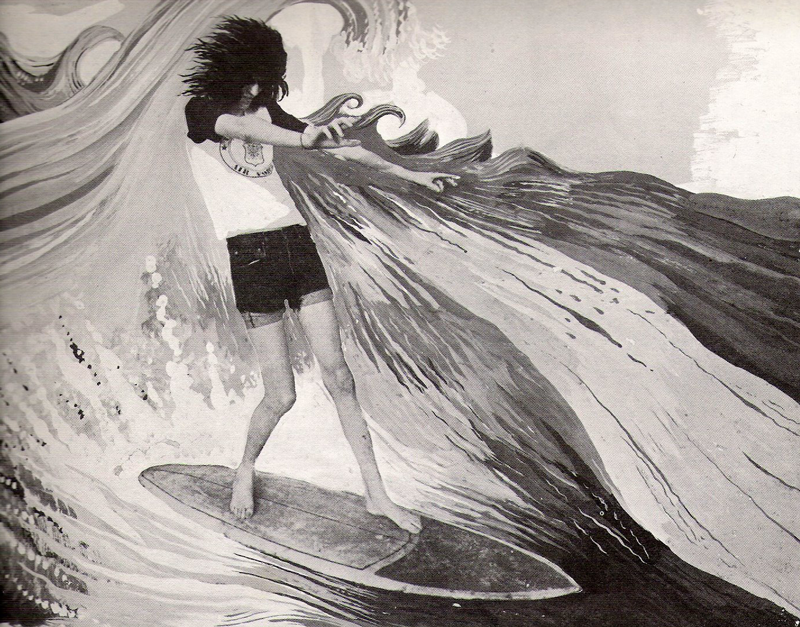 Surfing Joey Ramone, from Punk magazine #17, “Mutant Monster Beach Party.” Photo by Roberta Bayley. Special effects by Bruce Carleton. Courtesy of PUNK Magazine, Inc.